Remove the 'semitransparent' setting from the watermark. Does your watermark in Word look fine on screen, but print as "D AFT" instead of "DRAFT"? Or "CON IDE TI L"? This problem seems to occur sporadically, and it depends on the printer you're using. The solution is to turn off the Semitransparent setting. Click Format > Background > Printed Watermark. Now, un-tick the Semitransparent box, as shown in the screen shot in Figure 1. 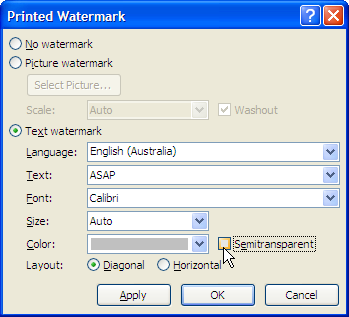 Figure 1: Word 2003 and earlier versions: To ensure that your watermark prints on all printers, un-tick the "Semitransparent" box. Click Page Layout > Watermark > Custom Watermark. Un-tick the Semitransparent box, as shown in the screen shot in Figure 2. Figure 2: Word 2007 and Word 2010: To ensure that your watermark prints on all printers, un-tick the quot;Semitransparent" box. View > Header and Footer and if necessary, navigate to the header that contains your watermark. 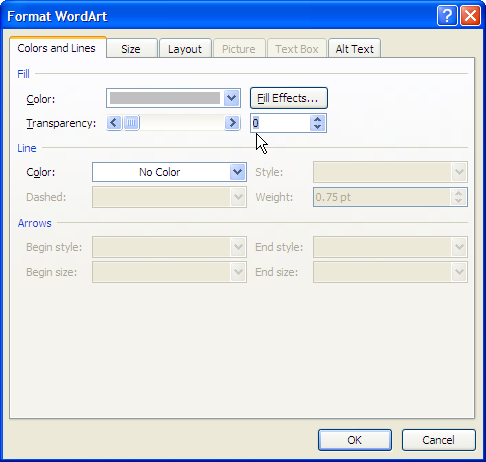 Right-click the watermark and choose Format WordArt. Set the Transparency to 0 (Figure 3). Figure 3: Word 2003 and earlier versions: To ensure that your watermark prints on all printers, un-tick the quot;Semitransparent" box. Insert > Header. From the menu choose Edit Header. If necessary, navigate to the header that contains your watermark. 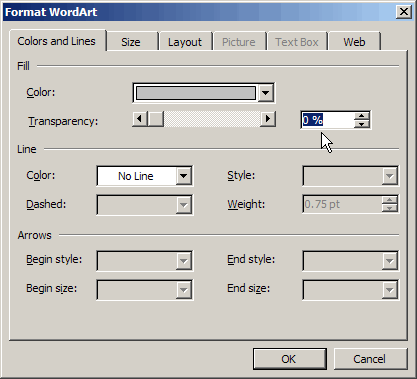 Right-click the watermark and choose Format WordArt. Set the Transparency to 0 (Figure 4). Figure 4: Word 2007 and Word 2010: To ensure that your watermark prints on all printers, un-tick the "Semitransparent" box. Does this really matter much? You might not have a problem printing the watermark. But what if you send the document to someone else? Let's say you're a consultant, and you send a draft of a report to a client. You don't know whether the client will be able to print the watermark properly. So good advice is to un-tick the Semitransparent box on all watermarks if you might ever have to send the document to someone else. This page was written especially for Liza.